134 min. Columbia Pictures. Directors: Jerry Zucker, Arthur Wooster. Cast: Sean Connery, Richard Gere, Julia Ormond, Ben Cross, Liam Cunningham. 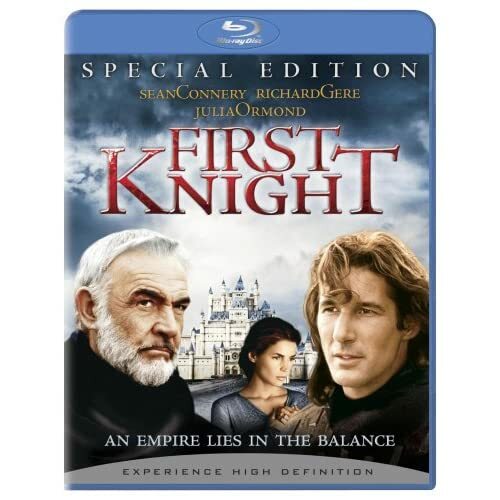 First Knight—a brave attempt at a fresh cinematic angle on Arthurian legend—has a few interesting ideas, but is ultimately brought down by a squishy script, a director (Jerry Zucker) lacking in a requisite feel for the material and, arguably, a miscast Lancelot (Richard Gere). The film goes for a pass as a shallow but occasionally rousing swordfighting flick with a handful of thoughtful scenes; clearly, screenwriter William Nicholson (Shadowlands, Gladiator) aspires to more, and it's anyone's guess why First Knight never reaches a greater height. Perhaps they were all in one of those Hollywood races to the screen that happen every couple of years: if so, First Knight lost there, too, preceded as it was by the superior Rob Roy and Braveheart. First Knight has something those other pictures don't have: Sean Connery as King Arthur. The picture takes place in Arthur's twilight years, as he hopes to rest on his laurels in an era of hard-earned peace. Unfortunately, the Lucifer-like Prince Malagant (Ben Cross) returns to the Paradise of Camelot to sneer at the Round Table and make the war-like pledge "I am the law!" The contentedly peaceful land of Lyonesse—home (at least in this version) to Guinevere—keeps running afoul of Malagant, leading old counselor Oswald (John Gielgud) to advise Guinevere (Julia Ormond) to marry King Arthur. In one of the film's strongest scenes, Arthur gallantly promises to protect Lyonesse regardless of Guinevere's decision, and the lady promises her hand to the great man all the same. Matters are complicated by longing looks and smoldering chemistry between Guinevere and Lancelot, who saves the lady from a homicidal ambush plotted by Malagant. Lancelot makes like Han Solo, putting out cocky romantic bravado that outwardly repels but quietly attracts Guinevere. The Romantic love triangle that follows is, to a point, the film's most successful element, as Arthur comes to a sudden, ego-bruising realization, and Guinevere tries to come to terms with which great man she more truly loves (could the answer be both equally? ); Ormond proves convincing both in her stunning beauty and her heartfelt anguish. Of course, the issue comes to a head at the same time Malagant storms Camelot, providing a dual climax. Though the Camelot design by legendary production designer John Box is modeled on a well-accepted historical rendering, it unfortunately resembles Disneyland, and its generic prettiness emblematizes the problems of a film that reduces the Kinghts of the Round Table to extras. The simplistic ideological argument between Arthur's sound idealism ("In serving each other we become free") and Malagant's sketchy counterpoint ("Men don't want brotherhood; they want leadership") fails to ring true, since Arthur's beloved leadership is so blindingly clear to everyone. Perhaps if Cross were allowed to play Malagant as unhinged (like Tim Roth's Archibald Cunningham in Rob Roy) or the script gave him a legitimate beef with Arthur, the plot would gain more credibility. As it is, First Knight has to wink and nod at the desired sum and make do with its parts, like editing by Walter Murch and the majestic score by Jerry Goldsmith. Both come into play in the climactic fight scene, during which Latin chanting predicts John Williams' "Duel of the Fates" theme for Star Wars: Episode I. When things get a bit dull, and they do at times, Britcom fans should watch closely for both Ralph Ineson—The Office's Chris Finch—as one of Malagant's henchmen and Marion & Geoff star Rob Brydon as a random townsperson of Lyonesse. Sony continues its parade of impressive Blu-Ray and DVD reissues with First Knight: Special Edition. The Blu-Ray revivifies the thirteen-year-old film with rich color and an image of considerable depth and detail. The disc offers two special audio tracks: a commentary with director Jerry Zucker and producer Hunt Lowry (which they good-naturedly kick off by apologizing to anyone who takes the film seriously) and an even better academic-minded commentary by Corey James Rushton, professor of medieval literature at St. Francis Xavier University. Rushton clarifies the many things this "rationalized" version of the King Arthur legend gets right, as well as the many aspects of Arthurian legend the film leaves out. Surprisingly, Sony has come up with some "Deleted and Extended Scenes" (7:16 with "Play All" option), including never-before-seen Sean Connery footage: "Stable Council" (1:29), "Horse Whispers" (3:14), "Swords and Words" (1:22), and "Home" (1:28). Vintage interviews are the stuff of two new featurettes on the film's making, though Gere apparently didn't agree to his comments being used (or he never made any?). 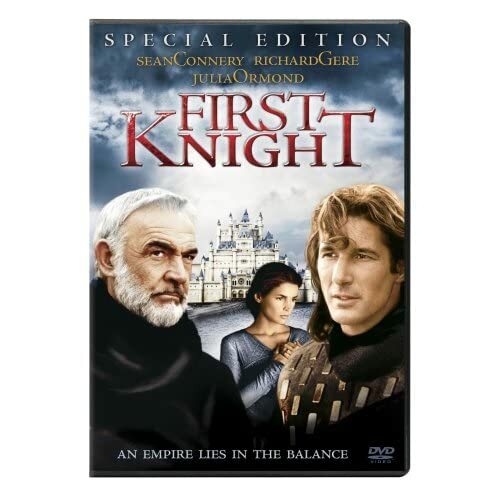 "First Knight: The Quest for Camelot" (18:51) gathers Zucker, Lowry, Connery, Julia Ormond, Valentine Pelka, Ben Cross, Ralph Ineson, and production designer John Box, and "The Creation of a Kingdom" (18:11) adds the comments of supervising art director Robert W. Laing, costume designer Nana Cecchi, and actors Liam Cunningham & Christopher Villers. The strangest feature is the appropriate inclusion of the new featurette "In Shining Armor: Knights in Training", which details the work and accumulated knowledge of The Association of Renaissance Martial Arts. What makes it strange is that the group's earnest director John Clements is just un-self-aware enough to suggest a new subject for one of Christopher Guest's mockumentaries. On the other hand, what the association has in mind—the historical preservation of archaic fighting techniques—is certainly worthy, and we see demonstrations by (and hear the insights of) Clements and members Benjamin Bradak, Joey Marmorato, and Aaron Pynenberg. Finally, the disc includes previews for The Water Horse: Legend of the Deep and A Knight's Tale. All site content © 2000-2019 Peter Canavese. Page generated at 04/19/2019 10:53:39PM.